This is my favourite,because I am a big fan of brinjal. I became a great fan of this vangibath,when I was staying in hostel and enjoyed this one in our hostel mess. I could not recreate the same taste,but definitely a very close taste to that iyer mess in SRC Trichy. Most of the Hostel mess will be a night mare,only we had almost a good time. Especially after noon lunch will be as good as home food! We had no problem….This vangibath will be once in a month…but it will be so flavour ful!!! You too can try this,I assure it will come out nice:) I am glad to send this to Srivalli’s Rice mela Event! Soak rice for half an hour,cook it with salt for 3 whistles in medium flame after first whistle. ( I used 1: 1& 1/2 , rice : water ratio) You can cook the rice with the whole garam masalas-cloves,elachi,cinnamon,bay leaves too. Cool the cooked rice and keep aside. Roast all the ingredients with few drops of oil under “To roast and grind” table to golden brown/nice aroma rises….except coconut…coconut can be roasted very slightly, so add it lastly. Cool it and powder it and keep aside.Cut brinjal into finger length strips and keep it immersed in water till use,cut ginger into thin strips and slit the green chillies.Extract tamarind juice from the tamarind. Heat the kadai with a tsp oil and add the seasoning items and roast it nicely. After done add ginger,green chillies and curry leaves.Add brinjals with turmeric and fry till soft. Add the tamarind juice,required salt for brinjal and bring it to boil. Add the ground masala and simmer for 3 minutes or till brinjal gets cooked. Take care that brinjal doesn’t gets mashed. At the end the masala will become a thick paste and shiny. wow.. looks yummy & delciious… awesome entry.. Excellent looking rice, very tempting one! I love vangi baath.. the recipe i follow is quite similar too. Love the pictures – they have me drooling. Wow looks like comfort food. I love long purple brinjals. But here in Bangalore we get small purple ones or long green ones. 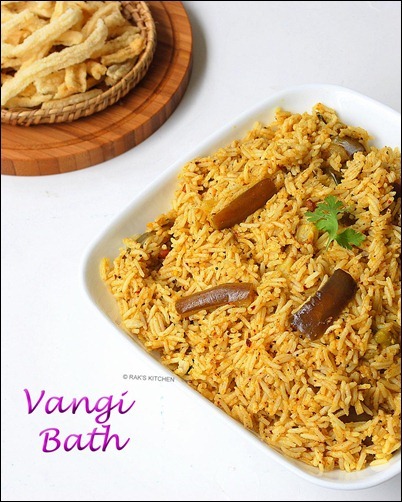 I personally dont like Vangi bath but this looks delicious. i like the fact that your new (perhaps old, but new for this just wake kumbhakarna) layout makes way for larger photographs 🙂 – makes food look even more awesome. i loved that keerai charu pic – fabulous. Looks delicious and spicy… Nice entry! Looks tempting!! Long time since I had it – no one else but me likes this! Hi, first time here, the vangi bath looks very delicious. Looks yummy.I make in a differnt way.Ur’s tempting me to try.Will soon make a try. That looks so lovely raji..thanks for sending it across! mmmm. vangi bath kaa kya bath hain? Looks so delicious and mouth-watering. 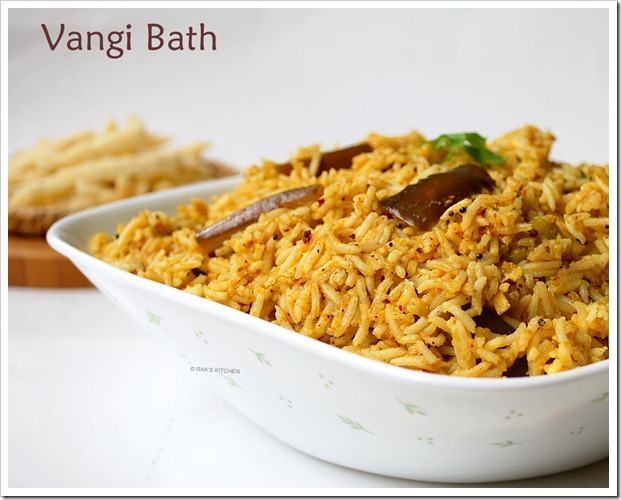 I love vangi baath.. looks yummy & delciious…small treat for u follow my blog. i love brinjals too and i get the long purple ones as well, especially cuz they don’t have worms in it like the smaller ones do..
that’s my all time fav rice items for tiffins bk in school days. I am regular visitor to your blog, love your recipes and pictures. I have tried many of them too. Only after I read this post I came to know you went to SRC Trichy. I studied in the same complex (Savitri vidyasala and KKV) for the first 12 years of my academic life. Brings back nostalgic memories. 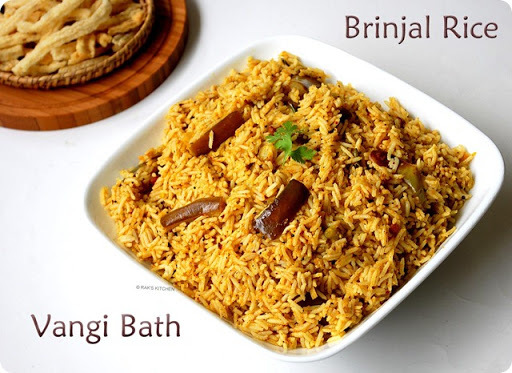 i would like to purchase the brinjal rice phot. I found your site on google search recently and i love all your recipes! I hav tried this bringal rice and semiya pulav and both were a hit! Thanks so much for ur recipes and the photo illustration makes it more helpful. Pls continue to post more recipes and keep up the good work. Tried it first time for lunch today. Was awesome… Loved the aroma of the roasted ingredients and the brinjals.. I started looking to your blog when i tried the kesari first time few months back, and it came very well too. I always go to my mom whenever i try new things, but now am looking your blog. I tried this kathirikai recepie too. Thanks for the dish this was very yummy me nd my hubby like alot.